G-20 leaders are attending a cultural show at the Colon Theater, the landmark in the Argentine capital that is one of the world’s great opera houses. She adds that U.S. President Donald Trump is “very active and committed” in the dialogue with all members. Officials in French President Emmanuel Macron’s office say that when Putin and Macron met Friday, Putin pulled out a sheet of white paper and sketched out the Ukrainian coast and the disputed waters where the weekend incident took place. The French officials say Macron asked for documents proving Russia’s claims, and insisted on the need for restraint in the conflict. Activists from France, Germany, Italy and several Latin American nations are taking part alongside Argentines in a demonstration organized by left-leaning groups and labor unions. It’s occurring more than 6 miles (10 kilometers) from the summit meeting. 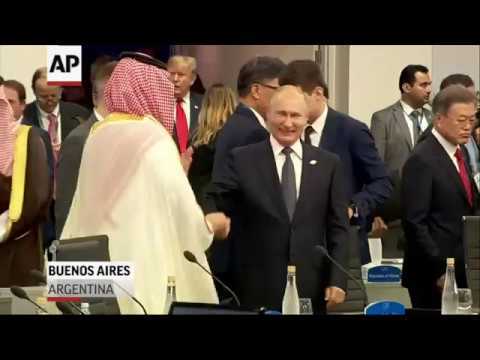 Russian President Vladimir Putin and Saudi Crown Prince Mohammed bin Salman have shared a smiley, enthusiastic greeting as the Group of 20 summit opened in Argentina’s capital. The two men beamed widely and clasped hands in something of a cross between a handshake and a high-five. The crown prince patted Putin’s hand three times for emphasis as the two leaders took their seats next to each other. In Putin’s case, other world leaders have expressed concern over Russia’s recent seizure of Ukrainian ships and their crews near Crimea. For the prince, it’s about the killing of a dissident Saudi journalist in the country’s Istanbul consulate. Saudi Arabia denies that bin Salman ordered the killing, but U.S. intelligence agencies have concluded the opposite. Because of resistance from President Donald Trump’s administration, an official in the French president’s office said that the statement may have language that sets the U.S. apart. For example, a draft says 19 of the participants agree on the importance of upholding the Paris climate accord, but the U.S. doesn’t. Argentina’s president has opened the Group of 20 summit with a call for member nations to support international cooperation and multilateralism. Argentina’s security minister is confirming that eight gasoline bombs were discovered in an area of the capital where a protest against the G-20 summit is expected later in the day. Macron’s office wouldn’t comment on what they discussed. On the eve of the summit, the French president called for international involvement in the investigations into Khashoggi’s killing in the Saudi Embassy in Istanbul last month. U.S. intelligence agencies have concluded the crown prince ordered Khashoggi’s killing. Saudi Arabia has denied that. Mexico’s government has presented President Donald Trump’s son-in-law Jared Kushner with the highest honor America’s southern neighbor gives to foreigners. Mexico’s Foreign Relations Department says that Kushner earned the Order of the Aztec Eagle for his work on renegotiating a new trade agreement signed Friday by Mexico, the U.S. and Canada. The award has caused an uproar in Mexico, where many are angry over Trump’s insulting comments about Mexicans. Kushner says U.S.-Mexico relations have improved because the countries decided to craft “win-win” solutions to migration, drug trafficking and other issues plaguing relations. The European Union wants world leaders to use a summit in Argentina to confront the Saudi crown prince over threats to journalists and the Russian president over his country’s actions in Ukraine. Facing the prospect of a no-statement summit, European delegations are trying to create a common front and may come out with their own separate declaration if they can’t get the U.S. or others on board. France is seeking to build coalitions on certain issues or “ad hoc partnerships” to try to salvage the spirit of the G-20 even if all countries can’t agree, according to a French official. The officials weren’t authorized to be named speaking about the closed-door discussions and spoke on condition of anonymity. Russian President Vladimir Putin has arrived in Argentina’s capital for the Group of 20 summit, where a highly anticipated meeting with U.S. President Donald Trump was abruptly called off. Putin’s plane landed Friday morning in Buenos Aires and he was greeted by officials on the tarmac. Trump tweeted on Thursday that he was canceling the one-on-one with Putin because of Russia’s seizure of Ukrainian vessels near the Crimean Peninsula, which Moscow annexed in 2014. Merkel’s arriving later than intended because a technical issue with her government plane forced her to change plans, but spokeswoman Martina Fietz said Friday she’ll still meet one-on-one with Putin on Saturday morning. Germany’s calling for the ships and sailors to be released, and is trying to help bring about a diplomatic solution to the crisis. Merkel’s office says she and a small delegation, including the finance minister, took a different government plane to Madrid on Friday morning, and then boarded a commercial flight to Buenos Aires. Leaders from the world’s leading economies were invited to the Group of 20 summit to discuss development, infrastructure and investment. As the gathering officially kicks off Friday, those themes seem like afterthoughts, overshadowed by contentious matters from the U.S.-China trade dispute to the conflict over Ukraine.